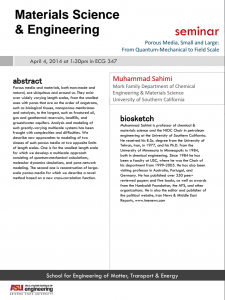 This seminar will discuss porous media and materials, both man-made and natural. These materials are ubiquitous and surround us. They exist over widely varying length scales, from the smallest ones with pores that are on the order of angstroms, such as biological tissues, nanoporous membranes and catalysts, to the largest, such as fractured oil, gas and geothermal reservoirs, landfills, and groundwater aquifers. Analysis and modeling of such greatly-varying multiscale systems has been fraught with complexities and difficulties. We describe new approaches to modeling of two classes of such porous media at two opposite limits of length scales. One is for the smallest length scale for which we develop a multiscale approach consisting of quantum-mechanical calculations, molecular dynamics simulations, and pore-network modeling. The second one is reconstruction of large-scale porous media for which we describe a novel method based on a new cross-correlation function. 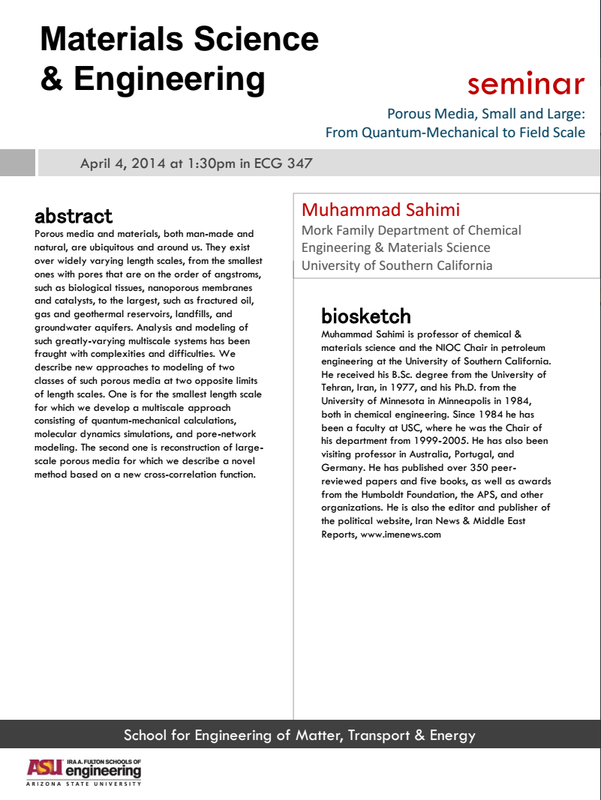 Muhammad Sahimi is a professor of chemical and materials science and the NIOC Chair in petroleum engineering at the University of Southern California (USC). He received his bachelor’s degree from the University of Tehran, Iran, in 1977, and his Ph.D. from the University of Minnesota in Minneapolis in 1984, both in chemical engineering. Since 1984 he has been a faculty member at USC, where he was the chair of his department from 1999-2005. He has also been a visiting professor in Australia, Portugal and Germany. He has published over 350 peer-reviewed papers and five books, and received awards from the Humboldt Foundation, the APS, and other organizations. He is also the editor and publisher of the political website, Iran News & Middle East Reports.